Fast RMX Review | Nerd Much? I get it — all of you Nintendo Switch buyers are busy playing Breath of the Wild, the game that most fans bought their console to play. But there are other Switch games to play, believe it or not, and if you can take yourself away from BoTW for a few moments to check out the eShop, you’ll be reminded of that. Out of all of the games available for the Switch’s launch, our second favorite is Fast RMX. Developer Shin’en Multimedia, unfortunately, accepted the challenge that is releasing alongside quite possibly the biggest game of the decade, so not many people have Fast RMX on their radar. But, they should, as the game does a lot of things right. 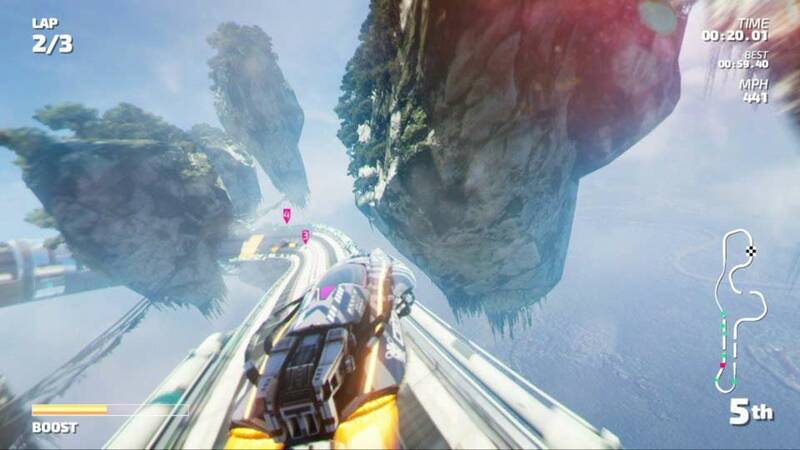 The high-octane anti-gravity racer comes with a plethora of courses right off the bat, including the 16 from Fast Racing Neo (the Wii U game everyone missed because no one had a Wii U), its DLC, and the six brand new courses. Along the same lines as Mario Kart, it has three different racing classes. It also has just three racing modes. You’re tasked with placing in the top three spots (out of 10 racers) for each set of courses in order to unlock more courses to do more of the same. Each set has three different courses, and as long as you place with an average in the top 3, you’ll earn the next set of courses and a new vehicle to test out. And while that might sound a bit too expected, each course provides enough variation to keep things exciting. In fact, the most impressive aspect of this speedy racing game is its course variation. While there are some typical and simplistic courses in the earlier stages of the game, as you progress, you’ll unlock much cooler courses with a bit more to offer. Some courses take you to a race on a cylindrical track with gravity mechanics akin to Super Mario Galaxy, while another sets you in a rainy jungle, and another tasks you with trying to race on a moving track. Also, on various tracks you’ll find moving elements and different hazard types to help make the races more interesting. And, when you’re on those rainy courses, it truly presents a distracting annoyance that really feels like what we’d imagine racing at those speeds through pouring rain would feel like. As far as vehicle variety is concerned, the numerous racers each have their own great-looking neo-futuristic vibe to them, and they each have their own set of stats. However, it’s hard to decipher their mechanical differences while racing, as you’re mostly going over 800 MPH (seriously, how noticeably faster can a car really be when you’re going that fast?). But, the stats are there on the vehicle selection screen. Fast RMX also has a unique mechanic where you’ll need to change your color based on the oncoming boost strip or jump pad. You have two color phases, blue and orange, and you’ll have to match your phase with whatever is ahead of you. It’s not a complete gamechanger in its current state, but it’s an interesting addition that makes for a slightly more interesting game. I would have liked to have seen a third or fourth color introduced to really vary things up and make it a bit more difficult, but that’s simply not what’s available here. But the ideal way to win your races is to learn each course’s best line that will not only hit all of the boost zones and jump pads but also as many energy orbs that are scattered about each course. These orbs are used for boosts. As far as Fast RMX‘s difficulty is concerned, each of the three difficulties are difficult, and we’re surprised there wasn’t an easier option. That’s not a complaint, by any means, but an easier race could appeal to the younger crowd as well as those who just want to take in the scenery that the game has to offer in its varied courses. I will note, however, that Hero mode, where you’re only given one life to get to the number one spot, is too difficult. I challenge anyone to make it to the end of one of those races and in the number one spot. 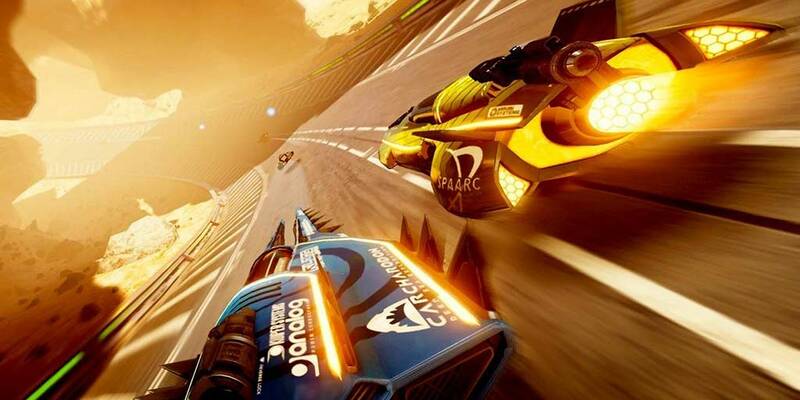 Online multiplayer is also an option for Fast RMX, but its basic options and lack of personality make it forgettable. I would have liked to have lobbies and more options, but instead, you’re basically choosing a car and being thrown to the wolves (although, we’re told its first update will add friending abilities). For those who prefer offline multiplayer, you’ll be happy to know that the game gives you a few more options, including the ability to choose your course. Where Fast RMX really shines is in its presentation, with impressive displays on both the Switch screen and while docked and on the TV. Both are presented at 1080p and 60fps, and I didn’t come across a single drop in framerate — surprising for such a fast-paced game with a lot of things coming at you quickly. The music might be generic and forgettable, but it sure looks good. If you love arcade racers like Hydro Thunder, Star Wars Racer, and, of course, F-Zero, you’ll likely love what Fast RMX has to offer. With its impressive presentation, highly varied tracks, and cool-looking futuristic racers, Fast RMX is a must-play for thrillseeking racing fans, and it’s another great start for 2017 in video games.